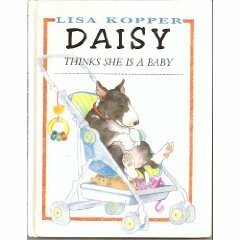 The answer to another of our bookquotes: Daisy Thinks She’s a Baby by Lisa Kopper. Is this book still in print? Shoot, I just looked it up and it isn’t. Gahhh! This always happens. We love this book to pieces—almost literally; after thirteen years of heavy use by five children (so far—Huck isn’t quite there yet), our copy of this absolute peach of a book is looking a bit loveworn—and I go to rave about it on the blog and then I find out it isn’t in print anymore and used copies are selling for almost thirty bucks on Amazon. Okay, libraries then: that’s your best hope, and yard sales. 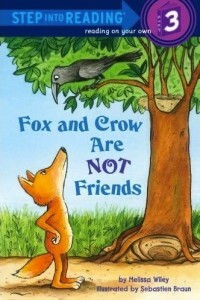 If you have very young children, especially in the two-to-four-year-old range, this is one of those perfect picture books you can read over and over and over (and you’ll have to) without getting sick of it or skipping half the words and incurring the Wrath of Toddler. It’s sweet, simple, funny, endearing. Daisy’s the family dog, and clearly she’s one of those dogs who thinks she’s a people. She rides in the stroller; “the real baby doesn’t like that.” Daisy eats in the high chair; the real baby is not amused. The real baby, in fact, takes a dim view of all of Daisy’s antics—until finally Daisy does something not at all baby-like, something very special and properly doggish, and the real baby likes THAT very much indeed. The colored-pencil illustrations are charming and full of quiet comedy. The real baby’s grumpy expressions are right on the money. Every one of my children has loved the comfortably simple and repetitive text. And after more than a decade in the company of Daisy and Baby, we find ourselves referring to the baby’s opinions all the time. Mommy says butter must be spread with a knife instead of scooped up with fingers? The real baby doesn’t like that. Big sister points out that we mustn’t lick our little brother’s head? The real baby doesn’t like that. Daddy scoops up a child for a ticklefest? The real baby LOVES that! There are a couple of more reasonably priced copies on Amazon UK (about $12). 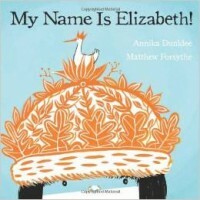 I see there are a few Daisy books – are the others good too? Have it on hold at the library! Thanks!! !